Oh god. The latest Mists of Pandaria beta build opens up Pet Battles to all players. 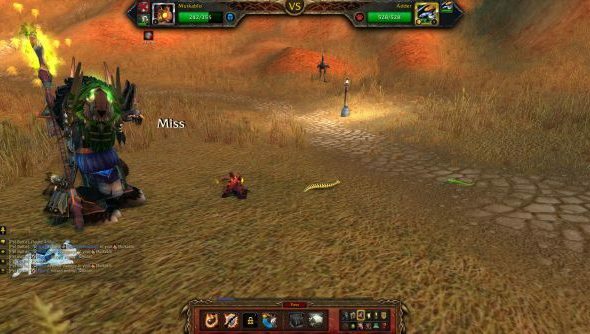 Pet battles are World of Warcraft’s take on Pokemon. The non-combat pets you’ve been carting around in your infinite backpack now have their own mini-game – in which you capture other pets around the world, engage in pet battles against ‘trainers’ dotted around Azeroth and Outland, or take on other players in matchmade competitions. Think of it as the Arena. But fluffy. The battles take place against teams of three, and are turned based. You’re free to swap pets in and out as you see fit, but each time you do, you’ll miss a chance at inflicting damage or using an ability. Each pet has six abilities that you can unlock by levelling the pet, but only three are available at any one time, and they can’t be switched during a battle. Almost all of your non-combat pets are available to fight – the only ones that aren’t are inanimate objects like kites or balloons. Each pet levels up separately, and if you’ve got more than one pet of the same type, they level separately too. To start fighting, you’ll need to find a Battle trainer in your capital city – and own one pet. And that’s it. At this point, you might as well forget about playing World of Warcraft proper for the next few days. The first point to note: the battles are brisk and fast enough to keep you moving, and the move through the initial levels at a rapid pace. You’ll get to level 5 on a pet in a few minutes. At that point, you’re about ready to start entering the matchmaking. 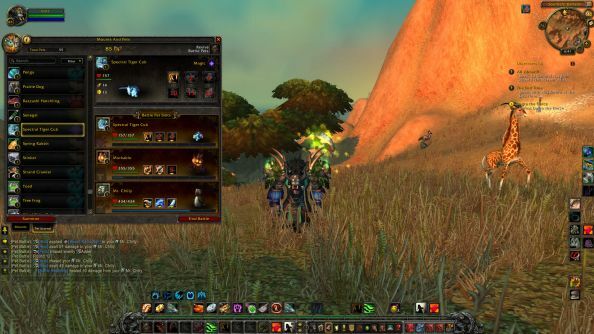 The second point: the stats of pets found in wild changes according to their rarity, using the same green, blue, purple and orange signifiers as the game proper. When you capture a rare or above, there’s an immediate impetus to level him up and use him in battles. The third point: Blizzard have worked hard on quality of life issues that mean you’ll rapidly fall in love with your collection. For a start, you can finally rename your pets. So Mr Chilly, my battle penguin, has now been renamed to Mr Awesome. There’s a new pet interface that shows you all the pets you own, and what’s also available to find. What’s interesting is that the battle system is an exercise in simple design that has extraordinary consequences. Most of the abilities that the pets have are shared between other pets, but it’s the combination of abilities that will matter to a trainer. Meanwhile, the effect of each ability changes according to the class it’s applied to: critters for instance, take more damage from beasts, but less from humanoids. But there’s an issues with the system that worry me. Captured pets that are discovered in the wild can easily be bought and traded on the Auction House. For instance, if you discover a rare critter, you can quickly pop it into a crate and sell it for profit. I wonder if this will have a similar effect on the sense of exploration and discovery that Diablo 3’s auction house had on the loot hunt in that game; I fear the best way to discover new pets or fill the holes in your inventory won’t be out in the world, but back in the capital city on the AH. That would be a crying shame. I think the pet battles are the best new feature in Mists of Pandaria – I’d hate for it to become another end-game mechanic that sees you farting about in the capital city.